At least 26 people have died after a tour bus caught fire in Taiwan's Taoyuan city, according to local officials. The bus smashed into a roadside barrier on a national highway and caught fire, Taiwan's Central News Agency (CNA) reported. It had been bringing the group of Chinese tourists to Taoyuan Airport to catch a flight back to Dalian. Officials said there were 24 tourists on board plus a local guide and driver. "The fire moved very fast. All 26 died," Lu Jui-yao, an official with the National Highway Police Bureau told Reuters. 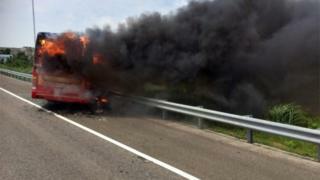 Pictures from the scene showed thick black smoke and flames engulfing the bus. The cause of the crash, shortly before 13:00 (05:00 GMT), was not immediately known. Taiwan authorities are still investigating. Taiwanese cabinet spokesman Tung Chen-yuan said tourism government officials had reached out to their mainland counterparts and would arrange for relatives of the victims to come to Taiwan.